On Friday, May 15, 2015, I officially retired from The University of Montana. This decision gives me more time to wander around the world in a state of amazement. 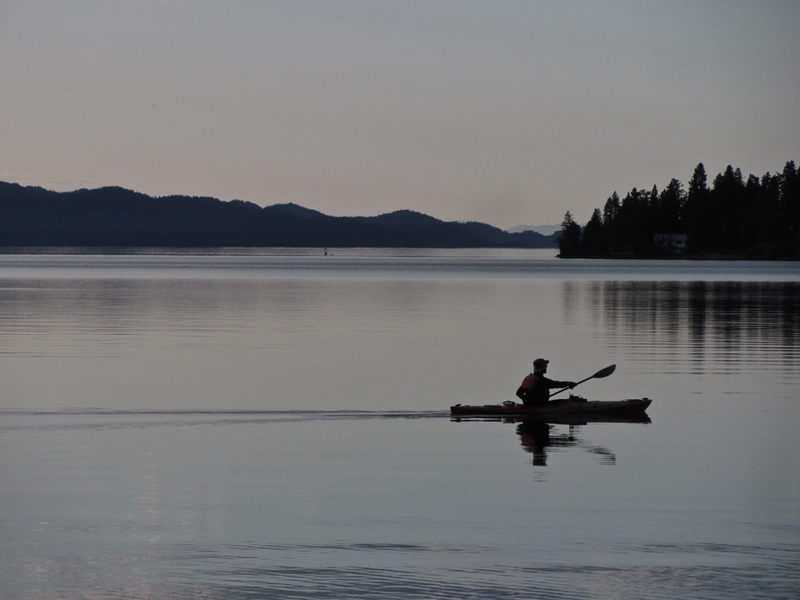 Going out the front door to retrieve the mail can lead to astonishment, but when the mid-week weather looked promising I drove up to Flathead Lake to paddle my kayak, sleep in a tent, and rise at May’s early dawn to paddle again. I spent the first afternoon exploring The Narrows. I circled islands, entered and paddled to the backs of long, deep bays left by the glacier’s retreat, and passed through the tunnel leading to Stone Quarry Bay. The evening invited even more paddling. After days of wind the lake was finally calm. 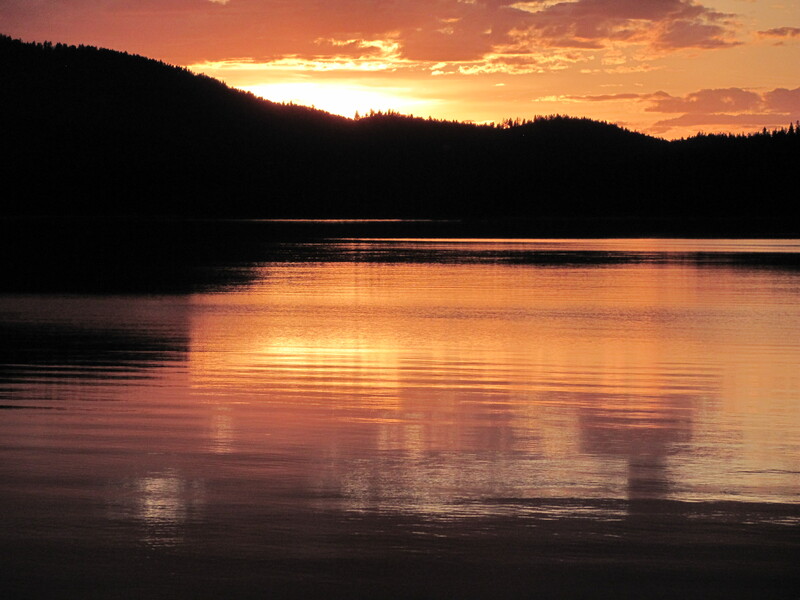 Remnants of clouds created the perfect conditions for a striking sunset, and I would have enjoyed paddling with my next-door neighbors in the campground who chose to paddle slowly through the waning light. In the end I decided to sit in my camp chair, read poems by Marge Piercy, and let the changing colors on the textured water remind me of Impressionist paintings. During the night I heard small waves collapsing on the shore. So when I crawled out of my tent at 5:45 I was not surprised to feel a steady breeze coming from the northeast. I have learned that waves on the lake grow not only in proportion to the wind, but according to how long the wind blows and over what distance. So, I drank from my blue water bottle, skipped breakfast and stepped into my skirt. I crossed Finley Bay easily as it is protected from most of the wind by the long peninsula of Finley Point. But as soon as I rounded the knob to the north I encountered the full force of the wind and waves. When I was in the trough between waves some of the approaching crests stood at eye-level. I pressed on toward Bird Island, my goal for the morning. As I paddled parallel to the island’s west-facing shore, passed the island’s northern tip, and made a 180 degree turn, the waves required my undivided attention; I did not even consider reaching for my camera or pulling into my favorite bay on the island. I feared getting trapped and pounded between the waves and the steep gravel shore. When it came time to make the turn, I waited for an interval between waves, made a hard fast sweep, turned south in the island’s lee and began to ride the backs of the waves toward home. Even my silent approach set off alarms among the geese on the island. In relative privacy they nest, lay eggs, and hatch their goslings on this sanctuary. As I slipped by, geese stood erect on the black blocks of argillite, their breasts extended into the morning sun. In time pairs and small flocks of geese launched and flew in circles overhead. After the adults lifted off, younger birds, seemingly torn between their island home and their desire to be with their kin, called out in distress. When the distance between themselves and their family members felt intolerable they leapt from the rocks, beat their broad brown wings and slapped flat feet against the water until they were able to join their elders in a circle around my passing. A few family groups came together into an organized flock and flew, as a friend says, as a single organism. As thrilling as it was to paddle through the morning waves, taking water down my collar, I felt elevated, even lifted out of my boat, by everything happening in the air and light. I could feel the elastic bands of belonging between and among birds, their attachment to each other and the island. It was as if I had entered a web of light and flight. My ears filled with the sound of wind, breaking waves, and calling geese, my eyes with the strokes of these powerful birds. I sat for my morning feast of amazement. The semester will soon begin. I want to get in another paddle before I am bound to the routine of classes, office hours, and the internal pressure to try to make each class better than the last time I taught it. I also need a way to discharge the anxiety that accumulates in the final days before I meet my students. With all this in mind, I drive up to Finley Point Campground, arriving at about 10 a.m., and park the truck in the main lot because I am not going to camp. To get a feel for the day I walk out to the point, still shaded by the cottonwoods. I find unusual conditions. The wind is blowing out of the southwest rather than summer’s more typical northeast. I turn to my right and notice several people standing on the docks trying to decide whether to take their boats out on the lake. Something about the conditions causes them to hesitate. 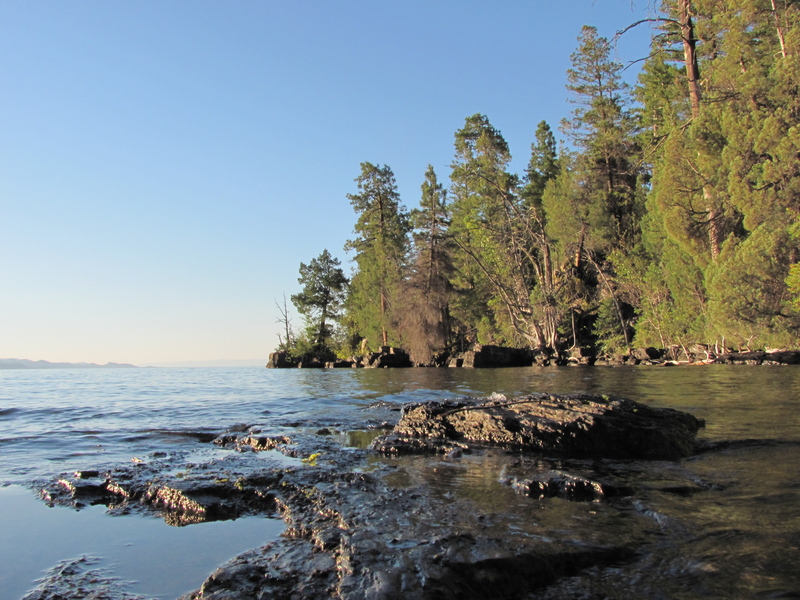 I pause and try to assess them for myself: large swells, unlike any I have ever seen on Flathead Lake, roll toward the north. The distance between rounded crests is much greater than when whitecaps fill the fetch. I am relieved to see that the tops of the waves do not break. If waves this size tipped over and broke I would stay on shore and watch, like a surfer who perches on the cliff and does not carry his board down to the beach. When I see that the wave tops are smooth, even in the shallows of Finley Bay, I decide to proceed. I pull out of the little marina and suddenly feel the full force of the wind and the way the big waves slide under me from behind. For a moment I question the decision to launch and consider turning back. But after a few dozen strokes I begin to feel more at ease: these big swells will not swallow me. I concentrate on my breathing and adjust my paddling rhythm to the rise and fall of the swells. Gradually, the tension leaves my body. After a few minutes I slip into effective and relaxed strokes, riding the remnants of what must have been a great storm. As I head north I am surprised by my speed. I have never experienced anything like these big, soft swells. It feels good to be moving with rather than against all this energy. If one were inclined toward seasickness, this would not be a good day. I associate this waveform more with the ocean, having seen such waves off the coast of Southern California when I sailed as a young teen with my father. (I later learn from my wife’s uncle—a lifetime ocean sailor, that these are “swell waves”). Though swell waves are normally generated by distant storms on the ocean, I am experiencing the aftermath of a strong late summer storm on the lake. These swells are the remnants of what was once a stormy inland sea. Carried on the round back of the swells, I quickly pass Horseshoe and Bare Belly Island to the east and notice a large powerboat heading toward an anchorage at the south end of Bird Island. By their quick movements, the people on board seem anxious to get to shore. Perhaps the rolling motion set up by the waves and a rising and falling horizon make seeking solid ground a necessity. I pass them as they wade ashore: they seem visibly relieved to be on land. Still assisted by the waves, I travel up the east shore of Bird Island, round the rocky point on the north end, and enter my favorite bay. I explore the island on foot, cross through the island to the east shore, struggle over deadfall, duck limbs and spider webs. Once through the tangle, I finally break into the open and look to the Mission Mountains. I decide to walk the shoreline back to my boat and bay. I hop rocks and wade through shallows. By setting my miniature tripod in the water I take a few pictures to get a water-level view across the bay. By the time I get back to my boat I need to cool off. I tuck my camera back into its waterproof case, climb the rocks and dive off several times, taking a few breast strokes into deeper water before turning around, swimming to shore and doing it again. I let the sun and air dry me as I eat my lunch. Refreshed now, and seeing that the swells have dropped, I paddle the long open stretch between Bird Island and Matterhorn Point. The old Texaco sign now seems like a tall friend or sentry. I slip between the rocks on the point and shore, rest briefly, then cross back to Black Point. From here I head south to Safety Bay, a deep little fiord that is well named. Finding no place to land for another rest, I keep going, cross the narrow channel to Bull Island, round it and then cross back to Finley Point through The Narrows. This trip, even through today’s swells, seemed relatively easy for a couple of reasons. I am near the end of a season of paddles. Having paddled as often as I could, I have increased my stamina. Time on the water and conscious effort to improve my forward stroke have helped me cover the day’s distance without feeling tired. This was a perfect 13-14 mile paddle, a mix of open water and close, shoreline details. If this is the last paddle of the season I will feel content. These high season summer days, with mostly clear skies and water that feels fairly warm, seem to pass as swiftly as geese riding the wind.